Juggling the complexities of tropical storm seasons requires a LOT of brain power, many charts, books, and computer programs, and some flexibility in scheduling. The Whangarei area is a large boating community – lots of people leave their boats or live aboard in the marinas for cyclone season. This location will give us easy access to repair work (we will need to get new bottom paint and do a few smaller projects) and easy access to cruise the Bay of Islands and down to Auckland. Our insurance is A-OK with us being anywhere in New Zealand for cyclone season. Then things get tricky. We wanted to sail up north – as far as Phuket, Thailand during the northern summer and then head down to Australia for cyclone season 2017-2018. A few days ago we whipped out our maps, charts, books, and insurance policy and discovered that our insurance (Jackline) will not allow us to be anywhere in the top half of Australia for cyclone season. That put us in a pickle. Do we commit to our plans, which would mean sailing all the way down to either Brisbane or Perth for cyclone season, adding at least 2200 km (1,400 miles) into our plans. As if Australia isn’t dangerous enough. Or, we could leave New Zealand in April of 2017, and sail to Australia…maybe to Sydney? 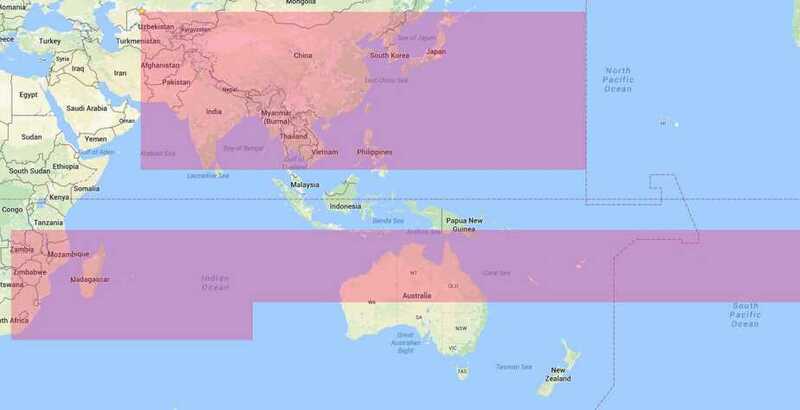 From there we can work our way up the east coast of Australia until we decide to jump off to Papa New Guinea or Indonesia. We would need to be North of Bali, Indonesia by December 1st, so that gives us 8 months…plenty of time to sail about 4,000 miles (as the crow flies). We’d spend December – March sailing up to Phuket, hitting Singapore along the way. Then we looked at two choices. The first is to backtrack to Bali, which is a good jump off point for the southern Indian Ocean (Christmas Island, Cocos Keeling etc starting in May). Or, we can head west from Phuket, and hit more of the northern Indian Ocean places (Sri Lanka, Maldives starting in April). Right now we lean towards sailing west from Phuket. Once we’ve got the tropical storm seasons figured out, we whip out World Cruising Routes, by Jimmy Cornell. We can look up each leg of our proposed route and make sure that his recommended months line up with our proposed schedule. For example, our insurance says we can spend all year round between 8N (Phuket) and 8S (Bali). But Jimmy Cornell tells us the best time to leave Thailand for Sri Lanka is January through March. So we have to get our butts in gear! 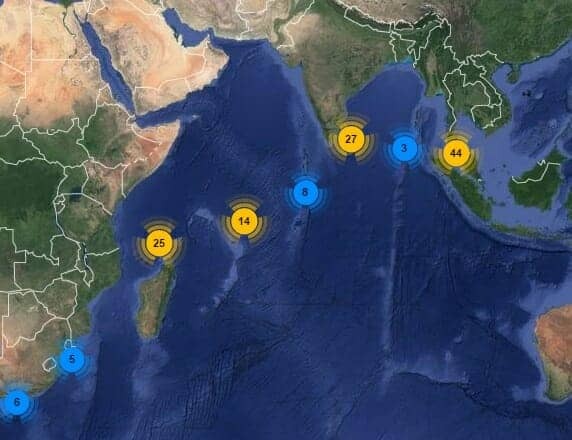 Another really great resource for me is other blogs, but if sailors don’t have a tracking map like we do, then I have to scroll through all their blog posts to put together locations and dates for their route. Thankfully, S/V Totem, who I’ve been reading for years, has a spot tracker on their blog. They’ve cruised this route from Southeast Asia to Sri Lanka, through the Maldives and Madagascar. And then, in either a big coincidence or proof of big brother, a story from Cruising World popped up on my Facebook newsfeed. The article was written by Diane Selkirk of Ceilydh over viewing their experiences crossings the northern Indian Ocean. We go through stages of planning. We (probably) have a fairly good idea of where we go tomorrow. Odds are, I’ve got an anchorage picked out and an activity planned. I’ve looked over the details for the next island and have put waypoints in the chartplotter. We have a guesstimate for our arrival date into the next country. I’ve got my materials available and am really excited about a few stops. Beyond that, all I’ve got is this rough route planned, which excites me to no end! I know we go to Fiji and Tonga, but aside from general tourist knowledge (oh, pretty beaches and snorkeling) I couldn’t tell you the names of the islands, anchorages, or landmarks. It’s amazing to look back at French Polynesia and take in all of the cultural and geographical knowledge we’ve gained in the last 86 days since we arrived in Fatu Hiva. Which, by the way, the day we arrived in Fatu Hiva to the date of our flight back to the states was 42 days – the longest I’ve ever been in one foreign country. David gets excited too – just not when I pull out the insurance policy and charts at 9pm and want to plan out next year tonight! I attended a seminar on change and decision making once and the professor convinced us that we will have made about 100 decisions before we even get out of bed. Does that context improve or worsen the headache? I still want to try to meet up in Australia if we can work it out on our end. Thought / if it’s difficult to reconcile locations in some blogs, maybe you could start a new trend by beginning or ending each post with your position? If people need it, at the very least it will save the cross reference, and if the tracker link ever goes away, it will make it easier to follow you. My head hurts too….LOL Besides all this terminology & geography being way over my head. I will continue being a part time server for Star Fleet Yachts & continue praying for you both on your exciting yet challenging adventures. We just completed the route from Florida to Thailand over the last 18 months. Our boat is Chapter Two, on sailblogs.com, our blogs are there. We sailed with Jimmy Cornells Blue Planet Odysee. Happy to share our experiences in front of you. Exciting and also a bit hectic trying to get it right. Most landlubbers think a cruising adventure is just Pina Colada’s all day. Thanks for the info. Looks like we not going to catch you on this lap! It’ll have to be on the next one then!! So if I’m reading this now it’s Thailand around March 2018??? It makes my head hurt thinking of all the decisions you have to make! I know! I wish we didn’t have to worry about all that and could just go where ever we wanted!